With the launch of their hotel self-service and check-in kiosk, Clock Software share their thoughts on how hoteliers can improve both their own operations and the customer experience of their guests. Answering the needs and meeting the expectations of guests is the core duty of every hotel employee, be it a manager, a receptionist or a housekeeper. And the same counts for hotel technology in terms of software applications or digital kiosk devices. Guest registration and check-in are for many people tedious procedures that they would gladly skip or finalise privately at their own convenience. In this regard, providing self check-in options to your guests can only contribute to their comfort and improve their experience on arrival which, in turn, increases the customer satisfaction with your hotel in general. There is no place for fear of dehumanisation here. Today’s travellers expect to be given the freedom to choose and the flexibility to use self service for some of their interactions with any business, including a hotel. If they want to skip the check-in and thus postpone the first interaction with your staff, don’t panic. In fact, check-in time is not the perfect moment to say “hello” and make a good first impression. Guests are often tired, have luggage to take care about, crying kids in their hands to watch after and the list goes on. 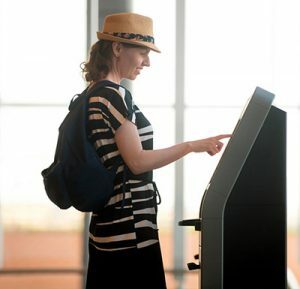 All this means that with self check-in and other self-service options you can change the way you service guests completely – either do it with less employees or switch their focus to value-added face-to-face services that are more impressive than handing out a registration card and a key. Let’s put it this way: a mom of two won’t remember how politely you gave her the room key but will never forget if you distracted the two tired kids for a moment until she completed that self check-in procedure at the kiosk. Self check-in has a great advantage – guests choose the time they use it at their convenience. This means that they choose a calm moment to register and check-in to avoid the hectic rush in front of the reception desk. For you as a hotelier this means that you get another minute to present your services and upsell or cross-sell, e.g. by offering paid upgrades, extra services and amenities or packages with added value. And while there are many reasons why having a consistent upsell policy followed by your front desk staff can be a difficult task, the check-in kiosk machine and/or the hotel self-service app will always do the job thus leading to an increase in your revenue. One issue with hotel self check-in has always been the integration between guest-facing apps and devices and the property management system the hotel uses. Data transfer and proper guest recognition have been the stumbling block for hoteliers to completely rely on the available self-service solutions. Luckily, these days are gone now and there are complete hotel management platforms where the data is accessible via multiple devices and shared across departments. This means that once a housekeeper marks a room as ready, a guest at the check-in kiosk can instantly book this room and get their key. Another advantage of the system interoperability is that guest data is stored correctly in the hotel PMS and will be available the next time the same guest visits the property which caters to the service personalisation. Such data can include previously occupied rooms, special requirements and notes, customer preferences, company information if any and so on. Particularly with Clock PMS, since guests identify themselves with a personal code that comes with the booking confirmation, all data is stored with the correct email address and duplicate profiles are practically eliminated. Hotel management software is slightly switching its focus from managing rooms and reservations to enabling real-time digital guest services in hotels. With the new generations of travellers and the constantly evolving online distribution marketplace, it is the capability of hotels to provide modern services that will help them remain competitive. Self-services in hotels, in terms of automated check-in, room selection, checkout, secure payment etc. eliminate the clerical part of the job for front office staff and leave more opportunity for human interactions, increase the accuracy of routine operations, reduce costs and improve the guest experience altogether. Clock Kiosk will be unveiled officially and will start selling at WTM London 2016 on 7th November, although first units have already been shipped to customers for beta-testing. It will be showcased at stand TT530 at WTM London in the Travel Technology section.